The Jackson State University, School of Public Health (SPH) was approved by the Mississippi Board of Trustees of State Institutions of Higher Learning in April 2015. This is the first and only such School developed in the State of Mississippi and at a Historically Black College and University (HBCU). JSU, School of Public Health offers the first and only Doctor of Public Health (DrPH) degree program in Mississippi. Jackson State University is accredited by the Southern Association of Colleges and Schools. The Public Health Program is accredited by the Council on Education for Public Health (CEPH) which accredits Public Health Programs and Schools of Public Health nationally. 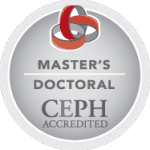 The Communicative Disorders Master of Science degree program has been awarded accreditation in speech-language pathology by the Council on Academic Accreditation in Audiology and Speech-Language Pathology of the American Speech-Language-Hearing Association (ASHA).